The Beating of His Wings by Paul Hoffman – This is third in the Left Hand of God series. I’ve been wanting to get to the first for a while! Elysian Fields by Suzanne Johnson – Again, this is the third in a series I’ve been meaning to start! Every Day by David Levithan – The blinding orange of the UK cover is the reason I’ve desaturated this haul pic. It’s horrid! Arclight by Josin L. McQuein – A few of my goodreads friends really enjoyed this one, so I will have to check it out sooner rather than later! Crash by Lisa McMann – I’m still quite annoyed about missing her signing at the National Book Festival – though I am glad I at least got this! Master of the Mountain: Thomas Jefferson and His Slaves by Henry Wiencek – If you are a Thomas Jefferson fan, you need to read this. He did not grow up to be a man you should model anyone after. I also received my A-MA-ZING Morganville Bunny Slippers for contributing to the Morganville TV Series Kickstarter project. As you can see, they are super super SUPER cute. They are also signed by the lovely Rachel Caine, though her signature will wear off if I continue to use them… it is already starting to! *hugs slippers to my chest* If there is a fire, these darlings will go with me out the door. Anyhow, thank you, as always, to the publishers who sent most of these books on – and to the authors for writing them! (Except you, Hamilton. You need to stop. I just don’t have the time anymore.) Can’t wait to see what everyone else got! As I mentioned, I picked up a lot of books at BEA. So many so that I had to make Many. Tough. Choices. about which would go where: some went with me to France, some went to my mother’s house and some were left in London for when I go back. These photos were taken the one and only time all these books will ever be together: in the NYC hotel room! So, apologies in advance for the low quality. Let’s break this down, shall we? Links all go to goodreads and hearts denote the books I am most looking forward to! Curse of the Broomstaff (Janitors, #3) by Tyler Whitesides (signed) – Didn’t mean to pick this up, but then saw the author do a fantastically awesome drum solo and knew I couldn’t resist (Watch it here!). Met a librarian in line for Brandon Sanderson who told me his books are great, so am looking forward to reading it despite the randomness of how I picked it up. The Twistrose Key by Tone Almhjell – Met a lovely Norwegian librarian who told me that the author of this book (Norwegian as well) translated it herself and then pitched it to the US market. Pretty smart! Something in the Blood: A Honey Driver Murder Mystery by J.G. Goodhind – This is from an indie UK publisher who did a fantastic job pitching this Midsomer Murders-esque series. Looking forward to checking it out! Well, that took an eternity and a half to put together. Out of all the books I picked up, I took only 15 back with me to read over the next month or so – let me know if you want to know which! 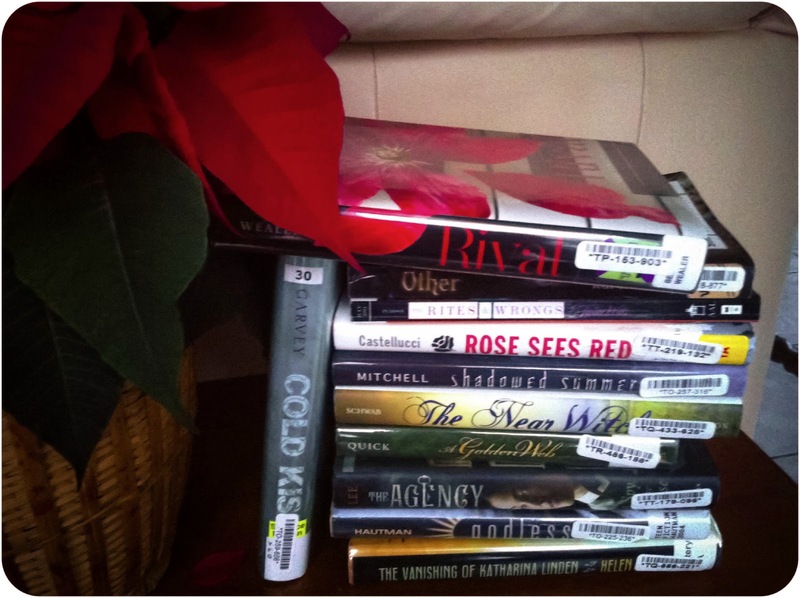 Another month, another book haul a-la Stacking the Shelves (Tynga’s Reviews) / Mailbox Monday. Over this past month the books have kinda just kept coming – mostly due to my inability to pass up a good deal. So, to save my sanity and to avoid breaking the Goodreads servers while getting links, I’m separating the books I’ve received as of late. Let’s start with the books I’ve received for review; I’ll be back later with the (much bigger) stack of recent purchases. Follow Me Down by Tanya Byrne – I received Heart-Shaped Bruise for review when it first came out, but still haven’t gotten to it. The Hit by Melvin Burgess – Not sure if this one will be my cup of tea, but intriguing premise nonetheless! Shipwrecked by Siobhan Curham – I am a wee bit confused by this synopsis… “Lost” meets “Gossip Girl”? What?! Could be brilliant – guess we’ll find out! Angelfall by Susan Ee – Yup – Angelfall! I bought the e-book of this eons ago but never got round to reading it. But this gorgeous UK printing by Hodder? It has be dying to get started on it. It is really rather shiny. Betterworldbooks have been on my radar for a couple of years but, for some unknown reason, I’d never gotten around to ordering anything from them. They are an awesome company that rescue books from landfills and then resell them online (with free international shipping). They give a lot of their profits to literacy campaigns so, on top of the knowledge that you’ve recycled a book, every purchase goes to promoting literacy worldwide. So when their 30% off New Year’s sale (for 10+ books) came out, and I knew it was time to place an order! The total: 11 books for just over £35 ($55)! Despite the few paperbacks that got thrown into the mix, I am very happy about the quality of these books. Even though they were library copies which meant I did have to spend some time removing dust jackets (often making small tears the hardcover), I am super happy with the final results! The pages inside are spotless and (with dustjackets on) the books look almost new. Pretty Monsters by Kelly Link – I bought this short story collection for my Short Story Challenge. The Graveyard Book by Neil Gaiman – Is it weird to be a fan of an author that I’ve never read? Because if it is, then I’m super weird ’cause I adore Neil and have never read a thing of his. A Study in Sherlock (Anthology) and Professor Moriarty: The Hound of the D’Urbervilles by Kim Newman – Nothing beats a bit of Sherlock fanfiction. Full Dark, No Stars by Stephen King – I admit it: I only bought this because it had wolves on the cover. I thought, “Well, since I’ve always been meaning to try Stephen King, I might as well try this wolf-y one.” Also, short stories! The Hundred Thousand Kingdoms by N.K. Jemesin – I have yet to read a bad review for this book, so I am rather excited to see what I think! Iron Crowned by Richelle Mead – I haven’t started Mead’s Dark Swan series yet (this is book 3) but I trust her enough to buy the books as I see them! That’s all for this week! What did y’all find in your mailbox? Hello fellow book lovers! It’s been months, but I am back with a big book haul a-la Stacking the Shelves (Tynga’s Reviews) / In My Mailbox (The Story Siren) / Mailbox Monday. These aren’t all the books I’ve acquired since my last post, but it’s a fair bunch of them. I also picked up a bunch at Eastercon, where I met a tonne of authors and covered for a radio station with another presenter. The segment was broadcast months ago, but is not online yet. Once it is, I will do a mini (belated) wrap-up! The Edge of Nowhere by Elizabeth George – This cover is really, really lovely. Hope what’s inside is as good as what’s on the outside! Darkness Falls by Cate Tiernan – I’m reading this right now and – after a few horrible pages – am quite enjoying it! Reviewed the first in this series here. Breathe by Sarah Crossan – I actually requested this one; it just sounds super awesome. Sarah’s blog tour is coming round soon, so you should see her one the interwebs soon. Zombies Don’t Cry by Rusty Fischer – This sounds absolutely hysterical and is on my very-soon-to-read pile! Kiss the Dead by Laurell K. Hamilton – This is book… 21 (?!) of the Anita Blake series. Seeing as how I am on book four of this series, I think it will be a while before I get to it. Though I have to say, the new UK covers are gorgeous. Wicked Business by Janet Evanovich – I’ve never read a book by Janet, but I know she’s super popular. This is the second book in a series – anyone know if I can get away without reading the first? The Chemickal Marriage by Gordon Dahlquist – This cover is GORGEOUS and the book sounds fab – but, again, it’s the third in a series. Do I need to go out and buy the first two? 1.4 by Mike A. Lancaster – Again, this is the second book in a series that I haven’t started. I have 0.4 on my kindle, though. May splash out on the paperback if I like it, as the cover is so freakin’ creepy! The Watcher by Charles Maclean – This is a re-print of a horror novel that came out in the 80s. I was surprisingly intrigued by the premise, despite it not being my genre. Skin Deep by Laura Jarratt – This sounds rather painfully good. I think I’ll have to get myself in a zone before I start it. Mister Creecher by Chris Priestley – This sounds rather fun, and I’ve heard great things about the author. Code Name Verity by Elizabeth Wein – Usually I am not a fan of historical novels, but this one sounds really, really good! And it has had fantastic reviews. Forbidden by Ted Dekker and Tosca Lee – Reading the summary for this one, I’m not sure quite what it is going for. It’s a dystopian, post-apocalyptic… horror novel? I think so, anyhow. The Power of Six by Pittacus Lore – This series isn’t up my alley, so I passed it on to an actual teenager (surprise, surprise!). Dissing You Already by Kate Kingsley – Again, not really my kind of book! Passed this one on as well. Shadow of Night and A Discovery of Witches (not pictured) by Deborah Harkness – This is one of those series that has had some fantastic crossover appeal. I am eager to see why so many people liked it! Between the Lines by Jodi Picoult and Samantha van Leer – I have never been attracted to Jodi’s books, but this one sounds brilliant. Contemporary fiction mixed with a fairy tale = just my cup of tea. A Touch of Power by Maria V. Snyder – I have had mixed feelings about Maria’s books; I really hope this book lives up to the quality of Poison Study and not the “meh”-ness of Fire Study. Heart-Shaped Bruise by Tanya Byrne – This one sounds super creepy! The Out of Office Girl by Nicola Doherty – Since I knew this wasn’t going to be my kind of book, I passed it on to a friend… who really, really enjoyed it. Apparently, if you are looking for a new chick-lit-type author, check out Nicola. I was going to include a bunch of books that I bought as well, but after that I am rather exhausted! You’ll see them next week. Any suggestions, people? I’ve got Zombies Don’t Cry and Breathe up next on my TBR pile, but I’d love some input!